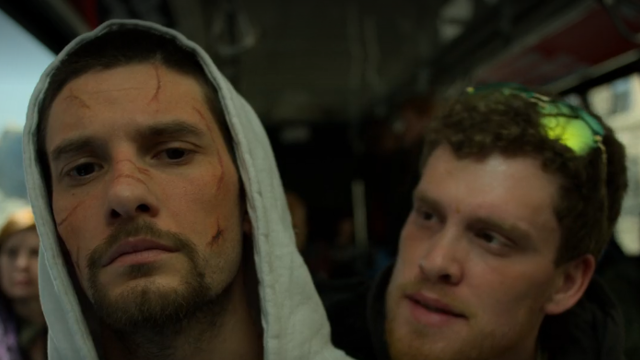 The Punisher season 2 episode 4 begins with Billy on a city bus. He only has on what he left the hospital wearing, which does not include shoes. A jerk gets on the bus and starts verbally harassing Billy, which Billy ignores until the guy talks about Billy’s messed up face. That gets Billy’s attention. when the guy gets off the bus, Billy does too, following him down an alley, which only Billy–wearing the guy’s clothes–emerges from. 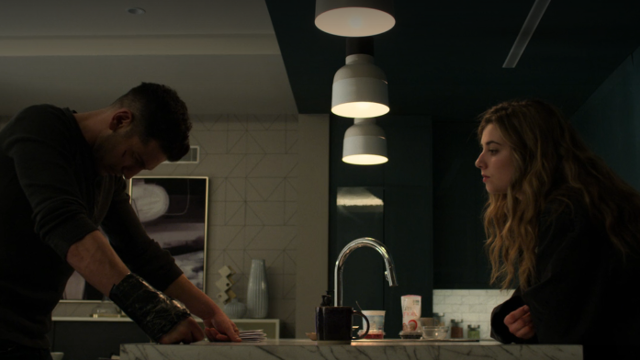 Madani sets Frank and Rachel up in her apartment. Madani lies to her boss about what she did in Ohio, saying that she went to bail Frank out so that he didn’t end up blowing back on the agency and that she dropped him outside of the city and told him to get lost. Meanwhile, Rachel cleans herself up and tries to get some rest, but ends up crawling under the bed and crying herself to sleep. She is also plagued by nightmares after seeing her friends killed. She hid under the bed when Pilgrim came back to make sure he had killed everyone, unable to escape. Madani shows Frank Billy’s journal. Frank might have moved on, but Billy hasn’t. She compares Billy’s drawings to the skull on Frank’s vest. She needs Frank’s help to find Billy and bring him in. Frank visits his old friend, Curt, who says that he visited Billy in the hospital and doesn’t think Billy was faking anything. Instead, he physically clawed back from the edge, but his head’s still scrambled. If Billy hasn’t reached out or can’t reach out to either of them yet, then where would he go? What Face Do You Want The World To See? Billy sits at an old little league baseball field near the group home he grew up in. He remembers telling Frank about the home, about his upbringing, and about how the director of the group home hurt him when Billy refused to be molested. Frank tells Billy that he never realized how lucky he was to have the childhood he had and how he wishes Billy hadn’t had to go through that, but it made Billy into the man that he is. Billy breaks into the house of the former group home director, since he can’t think of anywhere else to go. Billy is disoriented, not certain why he came here. When the old man mocks Billy’s disfigurement, Billy kills the old man. Billy follows Dr. Dumont home after work and asks her for help. Dumont considers calling the police, but still believes that Billy can be redeemed. Mahoney arrives at Madani’s apartment. 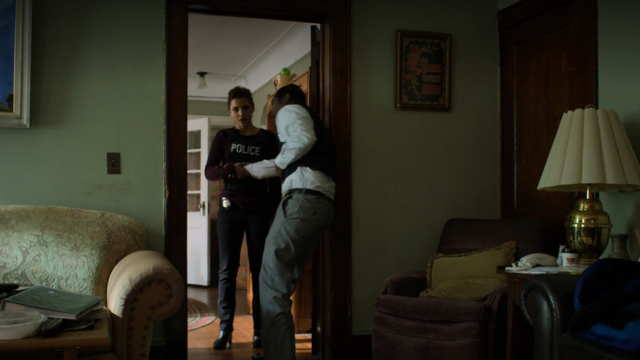 Frank and Rachel hide while Mahoney tells Madani not to go looking for Billy, that it’s the NYPD’s case. Madani follows up on Frank’s tip about the old group home director and arrives on the scene to find the old man’s body. Mahoney shows up right behind her and Madani shoots him in his bulletproof vest. Mahoney tells her that if she keeps poking around that he’s going to charge her with obstruction. Madani counters that she’ll tell everyone she just shot him. While Frank takes a shower, Rachel slips out and goes to a computer store. She pretends to be looking at a computer to buy, but is in fact researching Frank Castle after hearing Mahoney say his name. When she learns that Frank is The Punisher, she returns to Madani’s apartment and comes clean with her story. Frank suggests that instead of running, it’s time to take the fight to the people who are after her. 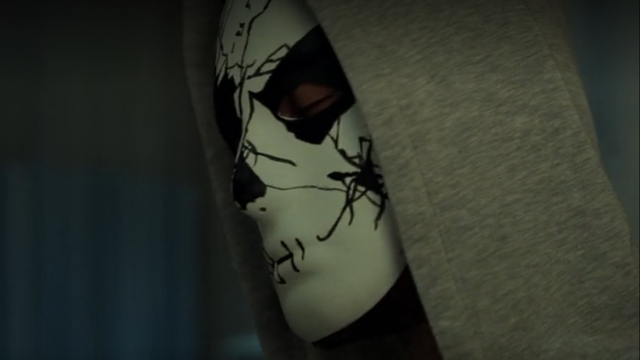 What are your thoughts on The Punisher season 2 episode 4? Let us know in the comments below! 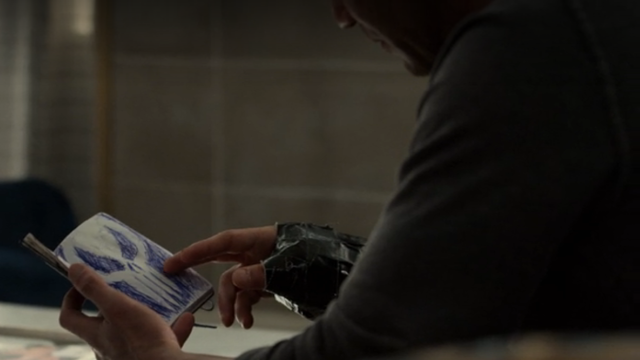 The post The Punisher Season 2 Episode 4 Recap appeared first on ComingSoon.net.